No, I'm Not Talking to Myself: Thanks, Google Images Search. I think I'm insulted. Thanks, Google Images Search. I think I'm insulted. 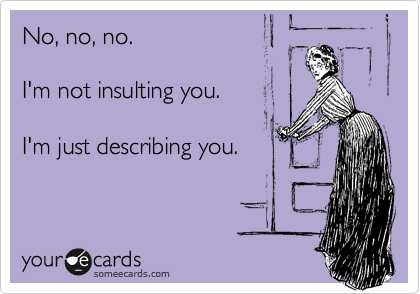 Apparently, if you search "insulting is not funny" on Google Images, one of the top images links to my blog. I'm funny. Dammit. No, really. (I'm also exceptionally humble and modest.) But in the blog I do my best not to be completely insulting. But for a moment there, I was insulted. And it was not funny. Apparently when people look for this, they get my blog. Not sure how I feel about that. I don't think your blog is insulting! You're a lovely witty person! Google is just odd. Like when I type in odd words I've used in previous blog posts, my blog comes up high. I realise this is because I'm logged on as me. Maybe if you log out it wont happen? Thank you, Laura! I'm not too worried about it; mostly amused. Maybe I should put a note at the top of my posts that say "if there was such a thing as a sarcasm font, please imagine me using that font for this post."